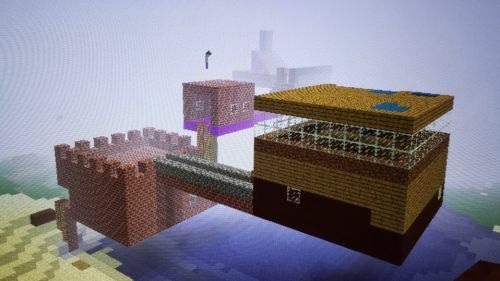 Minecraft castle built by me and my son. Teachers of math and computer science will find playful ways to teach their subjects using ScriptCraftJS. Thanks to the awesome work from Joel Levin and the community of Minecraft Edu, teachers can find thoughtful examples of engaging students in learning through Minecraft. This technology can be very powerful when connected to project based learning ideas and game based learning. As as a dad, I enjoy playing Minecraft with my son. It has been such a pleasure to encourage my son’s creativity by playing Minecraft with him. He’s still a pretty young guy. I, however, am amazed how well he can navigate through the Minecraft 3D world. He can build floors, walls, dig, and decorate. With ScriptCraft in my tool box, I hope to create more tools for us for our Minecraft playtime. How do I setup ScriptCraft on my computer? How do I start learning how to program Minecraft? What stuff can you program in Minecraft? What does the API for CraftScript look like? How could you draw a box in ScriptCraftJS? I’m new to running a Minecraft server. What are the common server commands? Can you make games in Minecraft using CraftScript? Walter Higgins has an awesome demo of creating a snow ball fight game. The video also includes brief overview of the code he used to create the game. Why Use Virtual Worlds To Teach? Thanks for the post! I’ve recently started a class for tweens using Scriptcraft, and I’m looking for others who have done this to swap ideas with. Know of any forums besides the rather dead google group? I am not familiar with Internet forums related to this topic. I would enjoy helping in any way that I can if you need help. For your class, what is your “dream” for your students? What is the learning or/and engagement objective? It features 744 engaged educators using Minecraft.